Estonia, one of Europe's smallest countries, has recently introduced an e-Residency program that allows non-residents to apply for virtual citizenship. We asked government CIO Taavi Kotka what gives. This week, I had the opportunity to take a dive into the Estonian startup ecosystem for a few days, on the fringes of the (awesome) Latitude59 conference in capital Tallinn. But, having never been to Estonia before, one of my main goals was to also learn about ‘e-Estonia’. e-Estonia is the moniker that’s been given to the small European country (population: roughly 1.3 million), highlighting the broad use of technology in all fields of Estonian life. People who pay even just a little attention to such things will know that Estonia has shown an unparalleled eagerness to develop and implement new ICT solutions both in public and private sectors over the years. But arguably the most interesting initiative by the Estonian government is the recently introduced e-Residency program, which basically enables anyone in the world to apply for a secure government-issued digital identity that can be used for a variety of things. Launched in late 2014 and dubbed a ‘governmental startup’ by its initiators, the e-Residency program has received media coverage from all over the world, which has given it quite a boost from the get-go. In fact, when the e-Residency application website went live last December, more than 4,000 people from 140+ countries expressed interest within the first 24 hours. 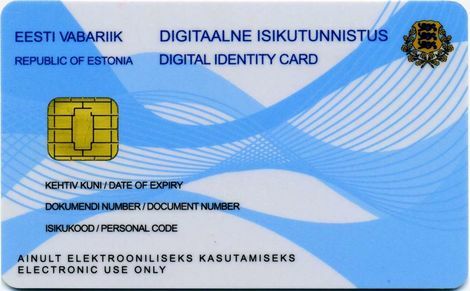 While the micro-chip equipped plastic card does not bring physical residency or rights of entry to Estonia (or the EU in general), it does facilitate the digital authentication and signing of a wide range of documents. Estonian e-Residency can also be used to establish a company, declare taxes or conduct banking online, ‘e-administer’ a business, open an Estonian bank account, and more. These are all things Estonians have been able to do for quite a few years already – and more, including online voting. It is far ahead of many a government in the world today, which is part of the reason to open up a good chunk of its e-services to non-residents from all over the planet. When I was in Tallinn last week, I was also fortunate enough to meet with Taavi Kotka, the CIO of the Estonian government, in between a series of meetings and speeches in the context of the annual ICT Week that was happening at the same time. Kotka explained to me that the e-Residency initiative is also a way for Estonia to compete globally, as a tiny nation in the Baltics where relatively few people are interested in moving to. He compared it to a startup that needs to appeal to customers in order to generate revenue. He also said he has a ‘dream job’ and often ‘feels like a kid on a toy store’. You can watch our video interview above. I was convinced enough to actually apply for Estonian e-Residency at the Latitude59 event that took place the day after our meeting, as you can tell from the picture below. Fingers crossed for swift approval. The e-Residency isn’t without detractors. The state-issued digital identity for non-residents of Estonia has been dubbed a PR stunt by many, a waste of time and resources by others, and an outright security threat by some. Many who criticise the program also claim that Estonia doesn’t really stand to gain anything from e-Residency, although I would beg to differ on that, given the publicity the country has received globally for its forward-thinking approach to digital identification already. “Physical nation borders and restrictions will no longer present an obstacle. You can start a business, open bank accounts, make transactions, sign contracts and even declare taxes, all on your computer,” adds Korjus. The target is 2,000 e-Residents by the end of this year, and Korjus says it will not require a lot of marketing as it basically ‘sells itself’ – in fact, keeping up with excessive demand has been a core challenge for the ‘governmental startup’. That said, Korjus and his small team are now focused on developing, marketing and packaging e-Residency in the next year and a half. “Within this period, e-Residency must become a finished, sellable product. It must be totally user-friendly and offer enough important and comfortable services, and it has to attract mass users,” he summed up the challenge to the print magazine. Also on the roadmap: partnerships with the private sector for the development of new and innovative services on top of e-Residency. I should get my approval and card at some point next month – I’ll be sure to report back on its utility!